Until the popularity of tanning in the 1920s and 1930s, the French Riviera, which stretched along the beautiful southern coast of France from Hyères to Mentone, was démodé for the upper crust during the summer. As such, the Edwardians considered it a winter playground, during which January was its high point. 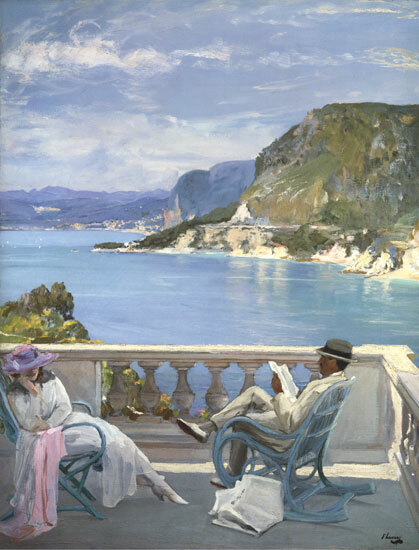 During the Riviera Season, the the choicest cities along the coast–namely, Cannes, Nice, Monte Carlo, and Mentone–were filled to the brim with millionaires, aristocrats, Russian Grand Dukes, famous actors and actresses, politicians on holiday, and the demimondaine. Travel was made easier by the joint services of the Brighton Railway of England and the Ouest and P.L.M. Railways of France, which afforded passengers a relatively quick and comfortable journey from London to Cannes, Nice, or Monte Carlo. On this route, travel from London to Nice was about twenty-eight hours. On a first class ticket on the Brighton Railway, the train would leave Victoria Station at 10 AM, reaching Paris in the late evening. One would then switch to an express train from either Paris-Lyon or the Paris-St. Lazare. Cannes was reached at 1 PM the following day, Nice at 2:10 PM, and Monte Carlo and Mentone around 3 PM. For those who did not want to spend the night aboard a train, the brand new Côte d’Azur Express left the Paris-Lyon station at 9 AM every weekday and reached Nice at 10:50 PM on the same day. Other routes to the Riviera: the London-Riviera Express, the Vienne-Cannes Express, the Calais-Nice Express, and the Nord-Sud-Brenner (this traveled from Cannes to Berlin). The villa was the chicest mode of residence along the Riviera. According to Blanche McManus in The American Woman Abroad, a villa “can be got for a year, often furnished, for the price of a month’s rent of the average New York apartment”–the prices of which ranged from $500-5000 for the season (January-April), according to size. The villa Beau Soleil was built on the usual casual architectural lines peculiar to these Mediterranean countries—rough stones, stuccoed white with a pinkish-orange roof of tiles. Solid green shutters rendered it as impenetrable as a fortress. On its gable, which was the front, was painted a golden sun, and in its centre the name. A white balustraded terrace, without which no Riviera villa is complete, overhung the water and was roofed with interlaced dry bamboo canes in the fashion of the country. The villa was of bungalow construction, so common to the country houses about the Mediterranean, called variously bastides and cabanons. There were four living-rooms and the usual big kitchen, designed for people who in winter use the one end of the kitchen as a sitting-room. There was one room under the golden sun in which we housed our one servant. The open terrace gave us a charming out-of-doors living-room where we could set up the literary and artistic shop. Here, too, we dined, literally under our own vine and fig-tree that tempered the rays of the southern sun. That the boathouse could be used for a garage. Hotel life was another option, with the best located in Cannes and Monte Carlo. Cannes is the first important town of the Riviera that the gourmet flying south comes to, and at Cannes he will find a typical Riviera restaurant. The Reserve at Cannes consists of one glassed-in shelter and another smaller building on the rocks, which juts out into the sea from the elbow of the Promenade de la Croisette. The spray of the wavelets set up by the breeze splashes up against the glass. Most of the crowned heads who make holiday at Cannes have taken their breakfast often enough in the little glass summer-house, but the prices are in no way alarming. A new dining and supping place has been given to The Casino Cannes by the building of the Municipal Casino. The Casino stands on the Croisette, and the windows of its great white restaurant look on to the wide sea-wall and promenade on one side, to the harbour on another side, and out to sea on a third side. The manager, M. Renaud, is one of M. Ritz’s lieutenants of old days, and everything is done with the finish of a first-class establishment. It is the place at which most of the fashionable dinner parties of Cannes are now given. In Nice, The Belle Meuniere, to which the revellers who have been over to Monte Carlo often return to sup, keeps open till all hours of the morning; Ernest’s prides itself on being the Maxim’s of Nice, and the Regence, which is now managed by Marius from Ciro’s, and the Garden Bar are two other resorts of the young bloods of all nationalities. In Monte Carlo, Ciro’s in the arcade is a restaurant only, or rather a restaurant and a grill-room and bar, and is very smart, and not at all cheap. At Monte Carlo one is given everything that can be imported and which is expensive. The salmon comes from Scotland or Sweden, and most of the other material for the feasts is sent down daily from Paris. The thrushes from Corsica, and some very good asparagus from Genoa or Roquebrune, are about the only provisions which come from the neighbourhood, except of course the fish, which is plentiful and excellent. Dining at the Hotel de Paris one pays in comfort for its popularity, for on a crowded night the tables in the big dining-room are put so close together that there is hardly room for the waiters to move between them, and the noise of the conversation rises to a roar through which the violins of the band outside the door can barely be heard. Grande fine Champagne des Tuileries. The Riviera season, as with all events in the high society lady’s life, required its own costumes. The tailor-made was an old stand-by, though in the winter it was made on more luxurious lines and fabric–trimmed by fur and velvet. New opera cloaks spruced up evening gowns left over from the prior season, and furs were a necessity. Gentlemen were required to wear morning dress and evening tails, as well as top hat, at all times. At the end of the Riviera season, ladies and gentlemen, perhaps lighter of purse after a visit to the Casino in Monaco, drifted back to their cities, where a new round of socializing began–all of which required new clothes, a chic home, and the best of everything.